Drop the drive-thru and make your own fast food tonight! 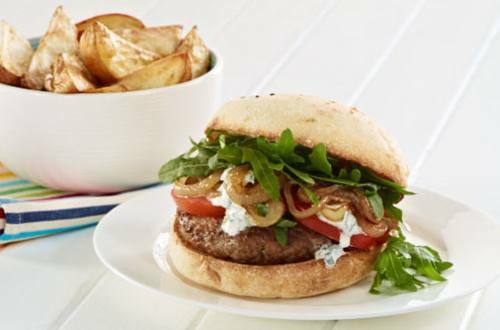 This homemade beef burger recipe is quicker than a round-trip to the burger barn and twice as healthy. Do you want smiles with that? 1 Heat oil in pan and brown minced beef until cooked through. 2 Add Soup Mix pack contents, water and tomato sauce simmer for 5 minutes or until sauce thickens, stirring occasionally. 3 Split and lightly toast hamburger buns. 4 Top base of each toasted bun with lettuce, tomato and avocado spoon over meat filling and sprinkle with cheese before placing bun tops on burgers.